Grandma always said you should be proud of your work around the house; you should be proud to take care of your home and family, and dress to show that pride. While grandma was a lady who liked to dress up, she wasn't the June Cleaver type who wore pearls while scrubbing out the oven or baking cookies (even at holiday time). But she still believed in being properly & attractively dressed for housework. One of the staples grandma recommended, naturally, was the apron. Sure, they can be absolutely adorable and therefore bring a smile to your face even if it is sticking inside a dirty oven (or is that just the fumes from the cleaner? ), but they are incredibly practical. 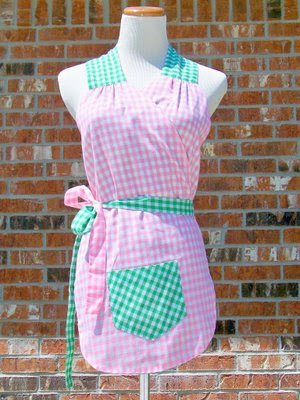 That is, aprons are practical if you are using them correctly. Here are my apron rules, as grandma and experience taught me. Bib aprons are nearly always the most practical. They cover more, and so protect your clothes better from splatters of food and cleaning products. They also almost always have nice big pockets. This means you can keep personal care items like hankies and tissues near, keep a small notepad & pen inside for writing notes and shopping lists wherever you are, tuck the end of a kitchen towel in the pocket so you can always dry your hands when the phone rings -- and nowadays, even keep your cellphone there. 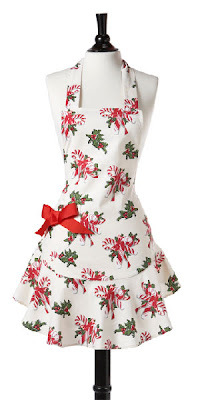 Why would anyone choose a standard apron when there's a bib apron? Aside from the obvious times when you are playing hostess or otherwise wish to show off more of your outfit, there are some chores, like dishes for example, in which splashes are most likely to only occur at or below your waist. There are also times when you really just want the pockets or you just like the feeling of putting on your work attire; and some people just don't like the extra layer on top. 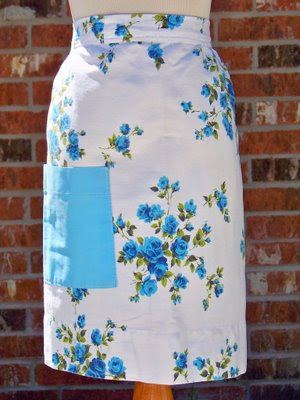 Whatever style suits you for working in, choose aprons made of sturdy cotton. Poly blends may be thought of as more likely to remain more stain-free, but many man-made fibers (especially the vintage varieties) actually stain worse than cotton and react more quickly to the heat of the stove & appliances -- including melting & burning into your skin & clothing. Cotton is also more absorbent than such man-made blends (or plastics); and cotton breathes -- if you're working so hard you'll appreciate it! The only time wearing an apron is not recommended to be worn while working is for scrubbing those floors or other chores which may have you on your knees. Not only will you likely soak the apron quickly (and anything in the pockets too), but the chances are very good that while crawling around your knees will 'catch' the apron, either ripping it or jerking you around the neck &/or waist -- maybe all of the above. Grandma warned me about that; but I had to learn the hard way. :sigh: You're better off removing the apron before you begin -- you can always put it back on again. Frilly aprons which do not wash well may be cute, but they are called hostess aprons for a reason: you wear them primarily for show. But they do offer a place to wipe your hands in a pinch, so they are helpful to the hostess while serving. A word about apron etiquette: Aprons are not to be worn at the table or, in the case of buffet style service etc., not to be worn while eating. Not only is this like wearing a hat at the table, but it does not signal that you are relaxed and enjoying your family &/or guests. Your guests will only be at their most relaxed, ready to enjoy your meal, if you, the hostess, are relaxed and enjoying your meal. So wear it serving, and then remove it before you sit down to eat. 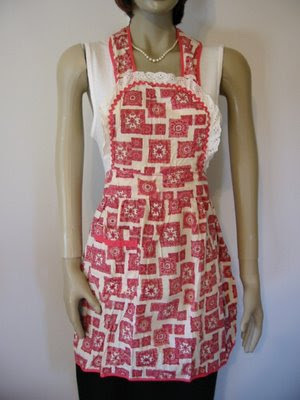 Do not hesitate to remove any apron, be it a hostess apron or a work apron, once it gets dirty or wet. 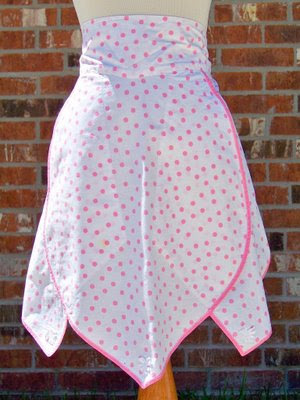 Changing aprons several times may be as likely and necessary as changing hand towels in the kitchen or bath. There's no sense in allowing the gunk on your apron to soak through to your clothes or drip onto (and contaminate) your recently cleaned surfaces &/or food; nor is there any sense in making yourself uncomfortable. You may be thinking that with all this wear that you're better off just to have ratty 'work aprons' which remain stained & are only replaced when they are falling apart; Grandma and I couldn't disagree more. One of the reasons aprons are worn is to show pride. 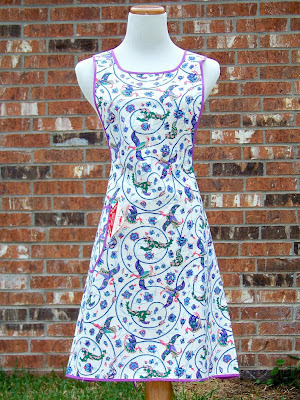 You should care enough about your clothes to want to protect them, yes; but you should also care enough about yourself to feel good, clean & pretty in a good, clean & pretty apron. So change your apron often, wash it often, and once it's served it's usefulness -- including as an attractive garment -- stop wearing it. Thank you for this post. I think it's going to make a difference in how I feel about doing my work and allow a way for me to "be off" when the day is done. ... I work from home and have really been struggling with the idea that I am never "off work" the apron is a GREAT solution! !